You are at:Home»iPhone»Wireless»Disconnecting Bluetooth Accessories Until Tomorrow On iPhone? The Fix! You were exploring Control Center when suddenly your iPhone said that it was disconnecting from your Bluetooth accessories until tomorrow. The Bluetooth icon went gray in Control Center and now you don’t know what to do. 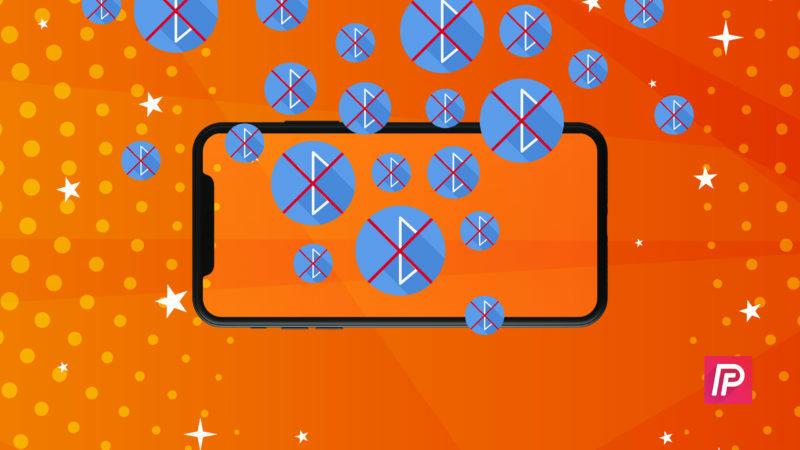 In this article, I’ll explain why your iPhone says “Disconnecting Bluetooth Accessories Until Tomorrow” and show you how you can reconnect to your wireless devices. Why Does My iPhone Say “Disconnecting Bluetooth Accessories Until Tomorrow”? 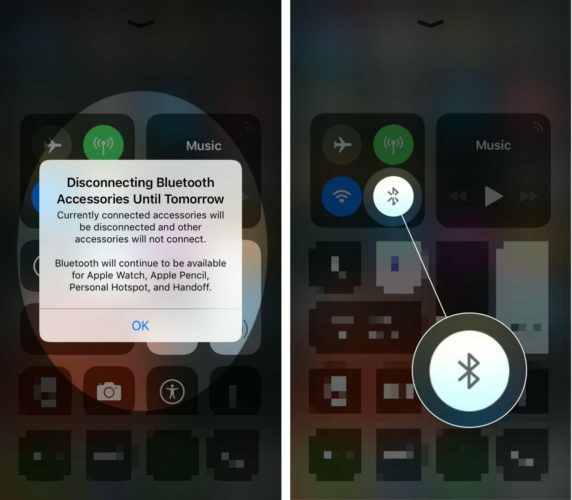 Your iPhone says “Disconnecting Bluetooth Accessories Until Tomorrow” because you turned off new Bluetooth connections from Control Center by tapping the Bluetooth button. The main reason why this pop-up appears is to clarify that Bluetooth hasn’t been turned off entirely, but you won’t be able to connect to Bluetooth accessories. However, you’ll still be able to connect to and use Personal Hotspot and Handoff as well as your Apple Pencil and Apple Watch. The first time that you tap the Bluetooth button in Control Center, your iPhone will say “Disconnecting Bluetooth Accessories Until Tomorrow” and the Bluetooth button will turn black and gray. This Pop-up Only Appears Once! Your iPhone will only say “Disconnecting Bluetooth Accessories Until Tomorrow” after the first time you tap the Bluetooth button in Control Center. Afterwards, you’ll only see a small message at the top of the display when you toggle Bluetooth on and off from Control Center. Open Control Center again and tap on the Bluetooth button again. 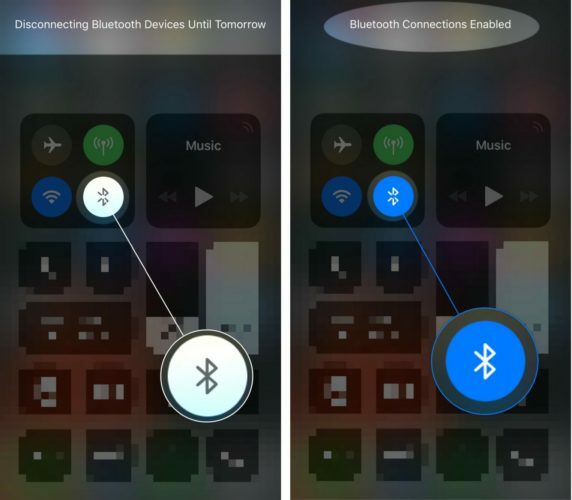 If the Bluetooth button is blue and white in Control Center, you’ll be able to connect to Bluetooth devices immediately. Go to Settings app -> Bluetooth, then turn Bluetooth off and back on by tapping the switch next to Bluetooth at the top of the menu. Go to Settings app -> Bluetooth and tap Allow New Connections. Afterwards, you’ll be able to connect to your Bluetooth devices. The biggest benefit of disconnecting your iPhone from Bluetooth devices until tomorrow is that your iPhone won’t automatically pair to your Bluetooth devices when you don’t want it to. Some Bluetooth devices will automatically connect when they’re in range of your iPhone. Maintaining that connection overnight, even when you’re not using the Bluetooth device, will drain its battery to some degree. Disconnecting Bluetooth Accessories Until Tomorrow: Explained! 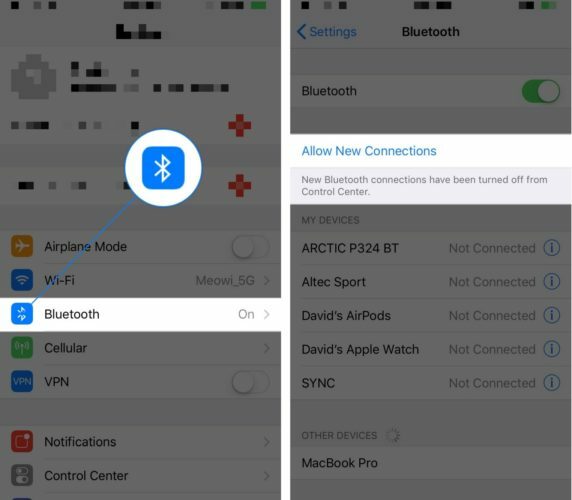 You now know why your iPhone says “Disconnecting Bluetooth Accessories Until Tomorrow” and how you can reconnect to Bluetooth after it happens. I hope you’ll share this article on social media with your family and friends so you can help them understand what this pop-up means too. If you have any other questions about this pop-up or your iPhone in general, ask away in the comments section below! Previous ArticleMy iPhone Screen Won’t Turn! Here’s Why & The Fix. Next Article How To Charge An iPhone Wirelessly & The Best Wireless Charger!